Context: The spatial relationship of posterior palatal seal (PPS) width and vibrating lines varies among individuals. Such variability could be related to contour of the palate. Aims: The study was carried out to evaluate the relationship between PPS width of the patient intra-orally and cephalometric tracing of the same patient. Second part of the study was formulated to determine whether the anterior and posterior vibrating lines can be distinguished as two separate lines by different observers. Materials and Methods: A lateral cephalogram was made to trace the hard and soft palatal contour, and the angle of the palatal contour was measured with the v-ceph program. Correlation analysis was conducted to examine the relationship between the distance from anterior to posterior vibrating lines and the angle of the palatal contour at the junction of the hard and soft palate. Statistical Analysis Used: The data were analyzed using the Karl Pearson Correlation test. Results: Correlation of the angle of the palatal contour to PPS width, showed perfectly positive value; whereas, correlation of angle between anterior nasal spine-posterior nasal spine (ANS-PNS) and PNS-Uvula (U) to PPS width showed partially positive value. Conclusion: The correlation of angle between hard tissue and soft tissue to PPS width, and the angle between ANS-PNS and PNS-U to PPS width, increases with an increase in PPS width. The definition of the vibrating line seems to be controversial and indefinite. In the glossary of prosthodontic terms, the vibrating lime is defined as an imaginary area rather than a line at the junction of the movable and immovable tissue across the posterior part of the palate that can be seen extending up to soft palate and extends bilaterally to the hamular notch. Location of the vibrating line relies on visual observation. Hence, a difference exists between different observers in determining anterior and posterior vibrating lines. Moreover, by that variation occurs in the PPS location and size. This study focused on location and size of PPS boundaries in different individual having different angles between hard and soft palate. The study was carried out to evaluate the relationship between PPS width of the patient intra-orally and that in the cephalometric tracingt. A second part of the study was formulated to determine whether the anterior and posterior vibrating lines can be distinguished as two separate lines of flexion by unbiased observers and compare it with lateral cephalometric tracings of angulations related to soft palate position. Prior to the initiation of the study, approval was granted by the Ethical Committee of the Institute. Seven dental postgraduate clinical students were selected as observers. Forty-two dentulous patients were randomly selected. The students were asked to record the anterior and posterior vibrating line on one patient each using colored marking pencils. The anterior vibrating line was also marked by the palpatory method (using t-burnisher) using a different colored marking pencil. The marked lines were then transferred to the previously made impression of irreversible hydrocolloid material. The study commenced by measuring the PPS width. PPS width was measured in patient's mouth using Vernier calipers. 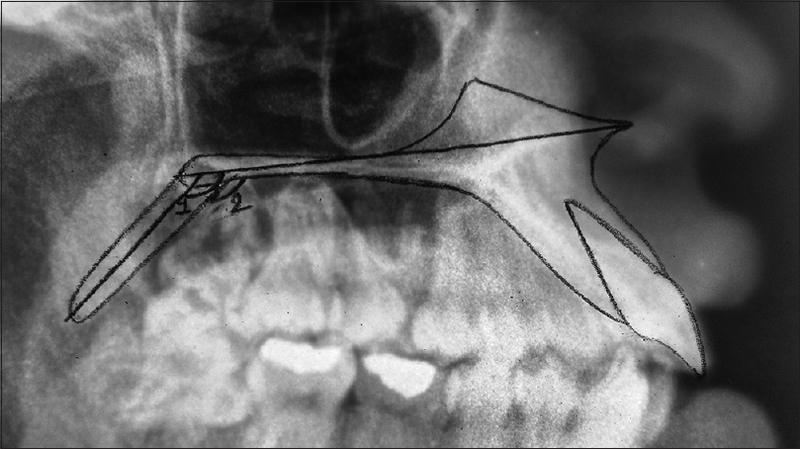 A lateral cephalogram was made to trace the hard and soft palate contour, and the angle of the palatal contour was measured with the v-ceph program. Correlation analysis was conducted with statistical software to examine the relation between the width of PPS (the distance from anterior to the posterior vibrating line) and the angle of the palatal contour at the junction of the hard and soft palate. The tracing points were anterior nasal spine (ANS), posterior nasal spine (PNS), Uvula (U), and shadow of the hard and soft palate. In contiguity with the second part of the study, observations recorded in the study were made by two observers, the study coordinator and the observer. The study coordinator first dried the PPS area with a gauze sponge. The subject was asked to perform the first maneuver (saying 'ah' in an unexaggerated manner). The hamular notch was located by palpation and marked using a pointed violet-colored pencil. The observer was then asked to mark the beginning of the line of motion of the soft palate with the violet-colored pencil. The dried impression was then placed in the mouth by the study coordinator to transfer the marking. The violet marking on the palate was then wiped off. The hamular notch was again located and marked with a pointed tip dipped in pink food color, and the subject was asked to perform the next maneuver (nose blowing). 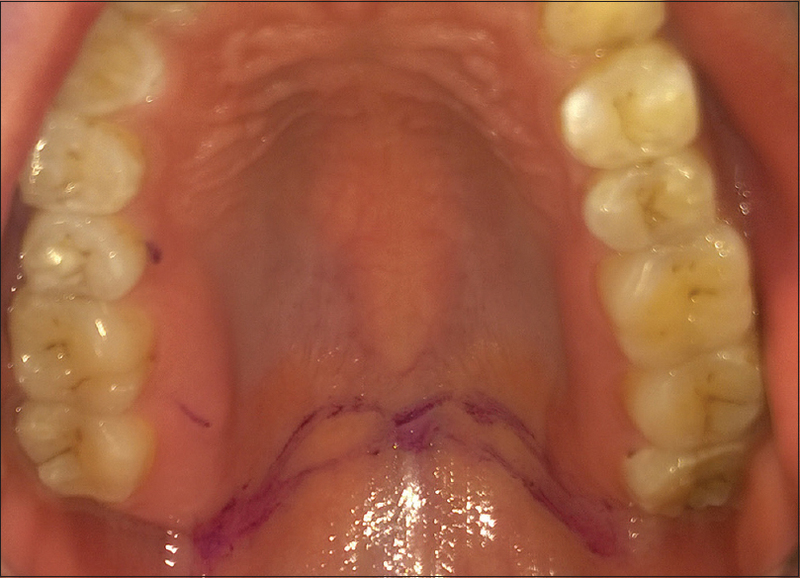 When the soft palate moved after gently pinching the subject's nose and having the subject attempt to blow air through the nose, the line of flexion was marked in violet color by the student; the dried impression was again placed by the study coordinator in the mouth to transfer the second marking. The marking was wiped off the palate. Correlation of the angle between hard tissue and soft tissue to PPS width and difference of marking errors of anterior and posterior vibrating lines, marked by different observers, showed a perfectly positive value. It means with increasing angle between hard tissue and soft tissue, there was also an increment of PPS width [Table 1]. Correlation of angle between hard tissue and soft tissue to difference between anterior and posterior vibrating line showed a partially positive value. It means when increasing angle between hard tissue and soft tissue, there was also increment in error determining anterior and posterior vibrating lines, but in higher numbers [Table 2]. Whereas the correlating angle between ANS-PNS and PNS-U tissue to PPS width and difference of marking errors of anterior and posterior vibrating lines, marked by different observer, there is partially positive value. It means when increasing angle between hard tissue and soft tissue there was also an increment of PPS width but on higher numbers. It has been agreed that the PPS area lies between these anterior and posterior vibrating lines. In order to correctly locate these lines, careful observation and palpation of the tissue are necessary, as their locations vary with the contour of the soft palate. In addition, the palatal tissues anterior to the posterior border need to be palpated with a blunt instrument to determine their compressibility in width and depth. The termination of the glandular tissues usually coincides with the anterior vibrating line. Thus, a combination of the palpatory and visual methods has been used in the present study. The dimension of the vibrating area may vary depending on the configuration of the soft palate. Use of this average dimension for determining the palatal seal area can deprive the patient of up to several millimeters or more of tissue coverage, which can have a direct effect upon the retentive potential of the denture base. The angle of the junction between the hard and soft palates measured from the lateral cephalogram was correlated to the distance between the anterior and posterior vibrating lines as measured from the left and right sides. Palate at the junction of the hard and soft palates is butterfly shaped. The boundary is relatively recessed anteriorly at the sides and projects posteriorly in the central region. , When these anatomic characteristics of the soft palate are considered with image overlapping in the lateral cephalogram, the point at which the soft palate meets the hard palate is seen toward the lateral side of the palate rather than at the palatal midline. In addition, the angle size formed by the ANS-PNS line and the PNS-U line showed no correlation with the distances from the foveae palatinae to the anterior and posterior vibrating lines and no correlation with the distance between the anterior and posterior vibrating lines. This result may be because the angle is created between the base of the hard palate and the soft palate, rather than between the surfaces of the soft and hard palates. There was a constant change in PPS width with change in the angle between hard and soft palates and ANS-PNS line and the PNS-U line. There is far more correlation of angle between hard tissue and soft tissue to PPS width than the angle between ANS-PNS and PNS-U tissue to PPS width. With increasing angle, there is also increase in PPS width. A significant difference between errors in marking PPS was also noted. With increasing angle, there was an increase in error while marking vibrating lines. The authors would like to thank Dr. Ghanshyam C. Patel for helping with the statistical analysis of the data. Goyal S. The posterior palatal seal: Its rationale and importance: An overview. Eur J Prosthodont 2014;2:41-7. Ettinger RL, Scandrett FR. The posterior palatal seal. A review. Aust Dent J 1980;25:197-200. Takamata T, Setcos JC, Phillips RW, Boone ME. Adaptation of acrylic resin dentures as influenced by the activation mode of polymerization. J Am Dent Assoc 1989;119:271-6. Firtell DN, Green AJ, Elahi JM. Posterior peripheral seal distortion related to processing temperature. J Prosthet Dent 1981;45:598-601. Polyzois GL. Improving the adaptation of denture bases by anchorage to the casts: A comparative study. Quintessence Int 1990;21:185-90. Sanders JL, Levin B, Reitz PV. Comparison of the adaptation of acrylic resin cured by microwave energy and conventional water bath. Quintessence Int 1991;22:181-6. Wallace PW, Graser GN, Myers ML, Proskin HM. Dimensional accuracy of denture resin cured by microwave energy. J Prosthet Dent 1991;66:403-8. Smith BG, Wright PS, Brown D. The Clinical Handling of Dental Materials. 2 nd ed. Oxford: Wright, Butterworth-Heinemann; 1994. p. 200. Yeung KC, Chow TW, Clark RK. Temperature and dimensional changes in the two-stage processing technique for complete dentures. J Dent 1995;23:245-53. Consani RL, Domitti SS, Rizzatti Barbosa CM, Consani S. Effect of commercial acrylic resins on dimensional accuracy of the maxillary denture base. Braz Dent J 2002;13:57-60. Woelfel JB, Paffenbarger GC, Sweeney WT. Clinical evaluation of complete dentures made of 11 different types of denture base materials. J Am Dent Assoc 1965;70:1170-88. Chen JC, Lacefield WR, Castleberry DJ. Effect of denture thickness and curing cycle on the dimensional stability of acrylic resin denture bases. Dent Mater 1988;4:20-4. Ansari IH. Establishing the posterior palatal seal during the final impression stage. J Prosthet Dent 1997;78:324-6. The Glossary of Prosthodontic Terms. 8 th ed. J Prosthet Dent 2005;94:10-92. Fernandes VA, Chitre V, Aras M. A study to determine whether the anterior and posterior vibrating lines can be distinguished as two separate lines of flexion by unbiased observers: A pilot study. Indian J Dent Res 2008;19:335-9. Silverman SI. Dimensions and displacement patterns of the posterior palatal seal. J Prosthet Dent 1971;25:470-88. Chen MS. Reliability of the fovea palatini for determining the posterior border of the maxillary denture. J Prosthet Dent 1980;43:133-7. Winkler S. The posterior palatal seal. Essentials of Complete Denture Prosthodontics. 2 nd ed. Delhi: A.I.T.B.S. Publishing; 2012. p. 107-22. Alaa'a M. Salloum. Evaluation of the conventional method for establishing the posterior palatal seal. King Saud Univ J Dent Sci 2012;3:61-7. Kyung KY, Kim KD, Jung BY. The study of anatomic structures in establishing the posterior seal area for maxillary complete dentures. J Prosthet Dent 2014;112:494-500. Carroll EA, Shaffer FW. Redefining the posterior palatal seal on a complete denture. J Prosthet Dent 1980;43:105-7.
de Gee AJ, ten Harkel EC, Davidson CL. Measuring procedure for the determination of the three-dimensional shape of dentures. J Prosthet Dent 1979;42:149-53.